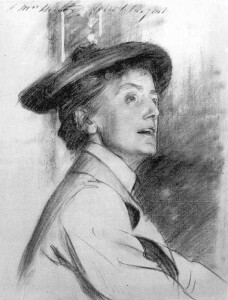 Dame Ethel Smyth, a famous turn-of-the-century suffragist and opera composer. Sketch by John Singer Sargent. As of March 2016, the Metropolitan Opera held an unfortunate distinction: In its 135 years of history, it had only ever performed one opera written by a female composer: Ethel Smyth’s Der Wald. This opera had its Met premiere in 1903 – just one year after its world premiere in Berlin (good) – and has never been revived at the Met since (bad). This peculiar distinction changed in the Met’s 2016 season, which offered Kaija Saariaho’s L’Amour de loin (Love from Afar). This opera premiered in 2000, which makes it a spring chicken by the Met’s classics-oriented normal repertoire. However, there is much room for improving this diversification.